We Celebrated Our 5th Year Together! If you don’t know from Facebook, Calvin and I have started a blog together over at http://www.IMLoveBirds.com which is on internet marketing as well as an update on what we are doing in the IM scene. We’ve covered content of a whole variety and even on keeping your success journal! That’s garnered a ton of blog comments! But nonetheless, do check back here because I love to share my personal stories over here. So anyway, the highlight for us recently is the fact that we celebrated our 5th year together! We are still dating! A lot of people thought that we were celebrating our 5th wedding anniversary from my facebook updates and I got people wishing me over Skype, “Here’s wishing you and your hubby forever love!” Haha.. That’s so embarrassing! To celebrate this once-in-a-lifetime occasion, Calvin and I went for a movie at GV Vivo Gold Class (for non-Singaporeans, it’s a posh movie theatre which has plush couches and personalized service). We watched King’s Speech and well, we concluded that it was not a great date movie. Haha.. 😀 But nonetheless, I had a good laugh, Calvin had a good sleep. This was followed by dinner at a Spanish restaurant called Serenity which was in the same mall. The food was great! I love Spanish food (or so I realized that day) we had tapas, Paella and who can forget glasses of wine and Sangria~ Certainly delightful! Calvin was a true-blue romantic as he ordered a bouquet of roses and carnations for me which look so lovely! By the way, the picture is a candid shot ok! This journey of 5 years has been amazing for the both of us and we recounted the days back in University to the days now where we are working on the business together. It’s funny how we managed to get through everything together. We can only thank God for His goodness and His blessings upon us. Now, we get this question from our friends many times. We definitely have our arguments, disagreements and even fights. But at the end of the day, I guess it’s knowing that you both just want the best for each other that makes you “retreat” and then listen to each other. Before I end off this post, just want to thank Calvin for being such a great partner and boyfriend all this while. Sorry for the hiatus! Usually, I try to blog when I’m free but December has been a busy month and so, I didn’t manage to update my blog as regularly as I had hoped to. Bear with me now because this is going to be a long post. Don’t say I didn’t tell you earlier! So Patricia, what happened in December? 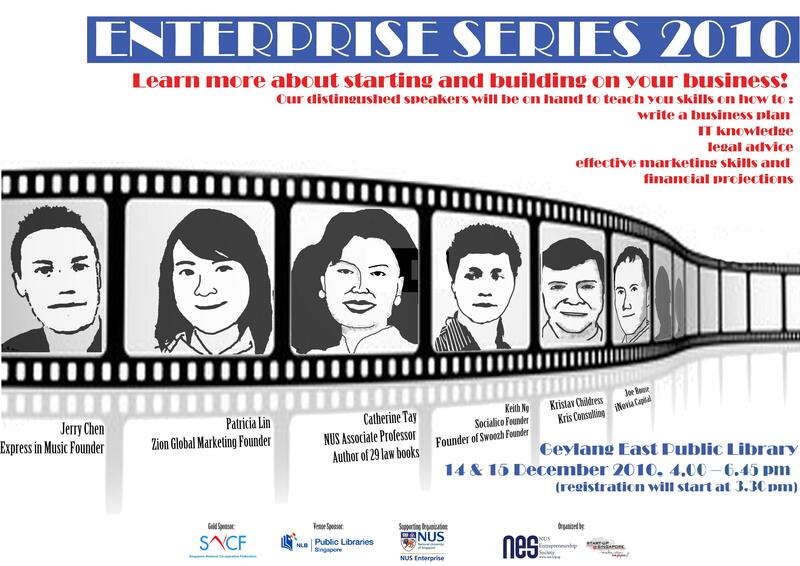 Well, the first thing was, I was invited to speak at the NUS Entrepreneurship Society’s Enterprise Series as one of their guest speakers. It was a milestone for me as I felt I managed to reach out to the people whom I wanted to help the most. Tertiary students who wish to set up something of their own but just don’t know how. I hope I managed to inspire at least a few of them. Then we’ve been busy with our private coaching students who have been such great participants and learners at each coaching session. They come from a variety of backgrounds and certainly all have different commitments. It’s quite interesting to hear the things that they have done before and the goals that they have in mind. To our dear ABP private coaching students, you can do it! Now, a few heartening emails came in via my personal email. One of them emailed me before and told me to inform him when we ran any of our internet marketing events and said he wanted to learn from us. It was nice of him to say that he has been wanting to learn from us for a long time but just never got the opportunity to do so. Well, hopefully we’ll get to see him at our next event in 2011! Another one came in by a poly student who said she admires Calvin and I, for our work and achievements. One Facebook message by another girl said, she’s inspired by the things we do and she looks up to us for motivation to pursue her interests. Needless to say, internet marketers are forever so gracious to thank Calvin and I for our offers, our products, the work we do, our team etc. Now, when I get such emails I feel a sense of satisfaction and it is a great morale booster to keep on doing what we do. So I want to thank everyone who has dropped us your emails and as much as we have inspired you, you have also made an impact by encouraging us to be better people too. What else happened in December? The highlight was a telephone call. A call I made to my secondary school teacher who taught me Chemistry, Ms. Jo-Marie. Now, I haven’t met or spoken to her in 9 years. And the reason why I called her was to thank her. Because in secondary 4, I did really poorly for my Chemistry and my studies and I was just losing sight of my goals and dreams. I think I was just disillusioned because I didn’t know what to do with my poor grades. I was losing interest in studying too. I did very poorly for a particular Chemistry test and Ms. Jo called me out from class and she said, “Are you a Christian? Because I don’t know why I wanted to tell you this, but I feel that God wants me to tell you that He is here for you and wants you to know He loves you. Are you attending church? If you aren’t, maybe you should go back to church.” I remember I teared. Not because she was telling me to go back to church but I felt the love of God so strong that He was sending his messengers to lead me. Because of that day, I felt that I couldn’t let God down. I needed to be a testimony of His goodness and set forth to be the best I can. Now almost 10 years down the road, I hope that I have glorified Him by being a witness and testimony of His love and goodness. So anyway, I plucked up the courage to drop her a call. I got her number from a good friend of mine. And told her, “Thank You.” I felt absolutely blessed to have the opportunity to speak to her and to convey my thanks. Via the phone call, I could feel her joy and surprise but at the same time, nostalgia of the time almost 10 years ago. If she’s ever reading this, I hope she knows there’s a student who is eternally grateful to her for being a messenger of God. The last few days of December were really times to just sum up everything and I really am looking forward to the New Year holiday weekend to have a well-deserved break. After which, it’s off to a GREAT START to 2011! I want to blog some more but my eyes are giving way to the Z monster. So I’ll continue later today on my conclusion of 2010! 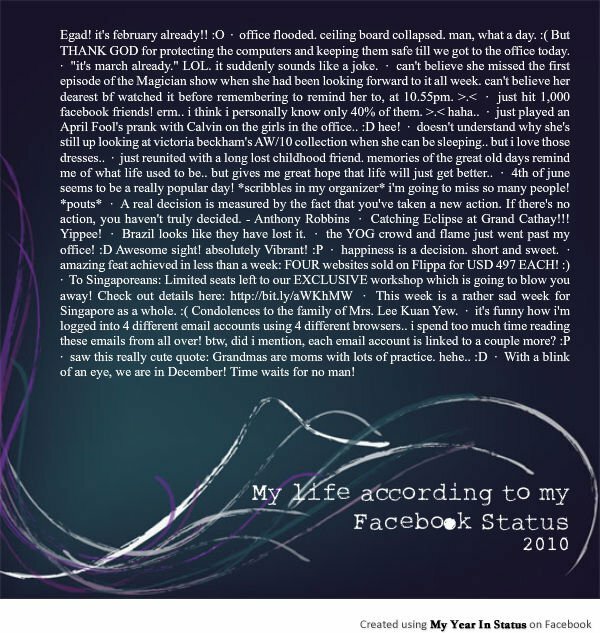 In the meantime, here’s the snapshot from Facebook’s My Status in A Year! I feel has aptly summed up my year!! Back in 2006, Singapore Didn’t Believe in Making Money Online! 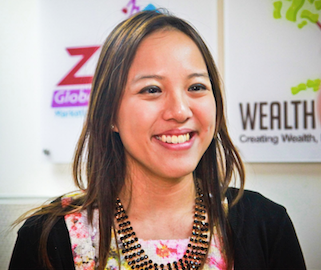 Earlier I was browsing some people’s blog (mainly Singaporean internet marketers) and it’s amazing to see how many of them have accomplished something for themselves – running coaching programs, setting up their own profitable online businesses etc. I have without a doubt, respect for these people who have carved something online for themselves. Back in 2006-2007, that was when Calvin and I started out and frankly the local internet marketing circle was much smaller because everyone was more cautious and fearful that everything’s a scam. Back then, we went on TV and the newspaper to share the concept of internet marketing and making money online and even publicly stated, we aspire to make 10k per month via the internet! Who at that time would have thought it was possible? Even the newspaper reporter said, “That’s inspiring!” but of course, she didn’t really think it was possible. People thought we were just a “one hit wonder” and just felt that it was just a fad. Well, it doesn’t help that we both are quite *shy* people and we’ve just quietly worked on our business, letting our results tell our story. And we’ve never gone publicly about our business or done any form of coaching etc. until our Accelerated Blogging Profits workshop in October. And to tell you the truth, now the Singaporean internet marketing community is getting bigger and getting more competitive. Like it or not, people are out there doing the same things, running the same courses and basically selling the same stuff. But it’s a matter of how they do it. And I’ve seen some pretty good stuff happening around. If you are also running your own online business/ in internet marketing and would like to share your own thoughts about the local industry or to network, do leave a comment here! 🙂 Would love to hear about your experience with internet marketing! Cheers! This is a really last minute post before I head to bed. I usually like to source for soothing songs for worship before I sleep because I just like to embrace in the Lord’s love and goodness. I always like it that He always has something prepared for me, even within a site like Youtube. To Upgrade WordPress or Not? I have trained to manage my time better ever since I attended MMI, which explains my “unusual” frequent blog posting for the past week. I pray that this will develop into a habit and not just die off as it has done before. Oh boy, I hate it when I see this. I don’t know whether I want to upgrade my current version or just stick with this one. Now, to tell you the truth, I have built hundreds of blogs and I always have the solution whenever something crops up, especially with WordPress. BUT THE ONE THING I HATE IS UPGRADING. I upgraded PatriciaLin.com once about a year ago and it messed up my entire blog. You can read more here. My categories went missing, so were my tags and everything else was just messy. Thankfully, the blog posts were still there which explains the presence of my blog archive. Now since then, I’ve always hesitated when it comes to blog upgrades. But now, not so much because I always back up my sites before I upgrade. It is still a little troublesome if I have to restore it when the new installation goes wrong. So now, I’m pondering if I should. I know the new wordpress version is AMAZING but I don’t know if I can afford the time to do that. Let me know if you think I should (for whatever reason you can come up with)!